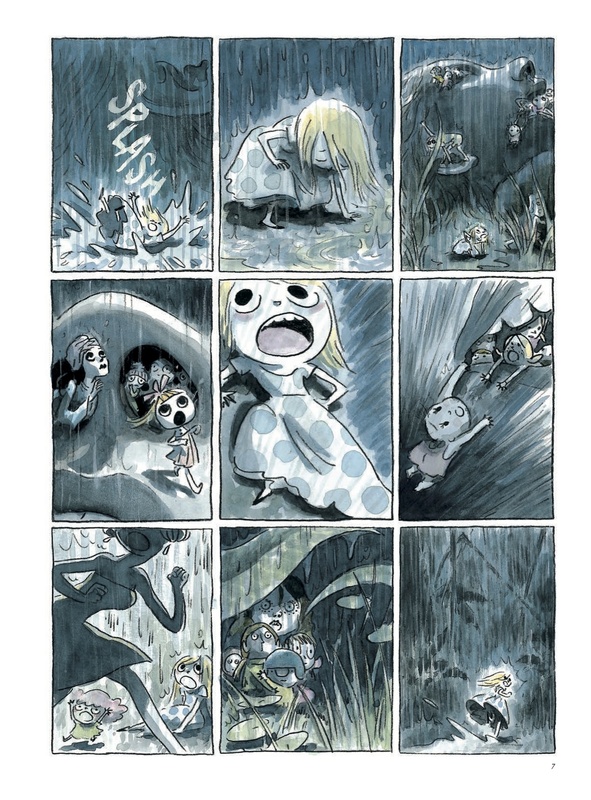 Beautiful Darkness, a translation of a French graphic novel by writer Fabien Vehlmann, with art of Kerascoet (the nom de plume of two married artists), is an elegant, surreal and thought provoking, if somber, work, that is deeply rooted in French existentialism. 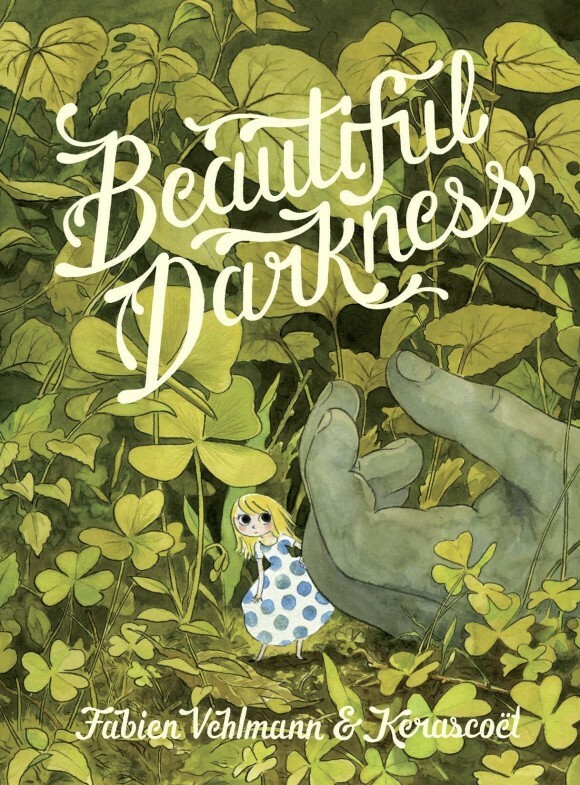 It has been described as a modern day fairy tale, but this description is a bit off: even though Beautiful Darkness invokes and even alludes to such stories, a fairy tale resolves with an answer and a moral, where Beautiful Darkness is more concerned with the journey and the questions that arise along the way. If there is a lesson to be taken from this book, it is that our dreams are far less complex than their reality, our future lies in uncertainty, and that our eventual destinations may veer far from the path we intend to embark on. The book opens in saccharine light watercolors playing out the idealized fantasy of a young girl’s dream future: a girl sits on a couch, waiting for her handsome prince to arrive for tea and cake. When he shows, they lob benign compliments at each other as everything builds towards a single kiss. It is the dream of happily ever after, a vague notion without detail – even the room itself is completely undefined, the interaction lacks any context. And then without notice, this world collapses, the dream cut short as the room is enveloped in a liquid darkness. 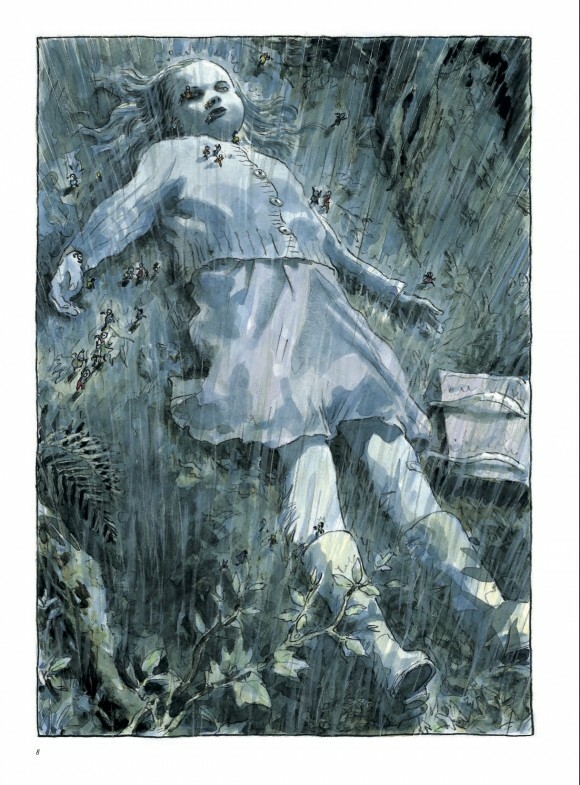 Aurora, the protagonist, struggles against this until she emerges into a rainy evening, standing on an alien landscape, until the world pulls back and reveals that Aurora is a tiny being, just emerged from the nose of a dead girl, lying alone in the deep woods. Around Aurora, other small beings dig out from the body as well; it quickly becomes apparent that each is a composite element of the dead child – a memory, a dream, a part of herself. Some are vain and selfish, others childish and cruel, while Aurora herself is idealistic, motivated, and naively optimistic. The book moves through three seasons, from Summer into Fall into Winter. During these months, the “fairies” (for lack of a better term) take residence around the base of the child’s decaying body, creating a Hoover Town from items in the girl’s knapsack, her clothing, and her hair, with one tiny being even moving into the child’s corpse. While they initially band together against external threats, this nascent society begins to fragment as the “fairies” turn on each other, their core essence – whatever remnant of the dead girl each represents – becomes increasingly exaggerated over time, as they begin to interact with and adopt elements of the real world in which they now exist. This story follows Aurora’s growth and transition as she navigates the increasingly complex and dangerous society in which she is forced to operate. In doing so, Vehlman toys with themes of change, of the imprecise nature of reality and the variant paths which this can put us on, and the great weights that we accumulate while on this journey. These elements, and the narrative itself, are largely visually driven – Vehlmann’s dialogue is sparse though poignant – as Kerascoet’s art creates a stark visual juxtaposition that is beautiful and painful and unsettling: the “fairies” are cartoony watercolors, entirely, contrasted against vivid depictions of the “real” world that is unflinchingly honest, though. Unquestionably, the end of Aurora’s journey is far afield from where she envisioned it in the opening scene, but it is left for the reader to determine if this is for better or worse.